Nearly 68,000 workers commuted between the New Orleans metro and its neighboring metros of Baton Rouge and Houma–Thibodaux in 2010 — an 11 percent increase since 2004 despite a substantial loss of jobs and population in New Orleans post–Katrina. This new Census Bureau data indicates increasing economic connections, a shared work force, and the potential for teaming up on economic development across three Southeast Louisiana metros. Other “super regions” offer examples for how the New Orleans, Baton Rouge, and Houma metros could work together. The cities of New Orleans, Baton Rouge, and Houma are each the center of a metropolitan region — a larger economic geography where labor is pooled, and innovation and production are concentrated. And yet some scholars suggest that important economic interconnections extend even further, and that “super regions” are forming across proximal metros. Census Bureau data allows us to quantify and visualize these links through cross–metro commuter patterns. Between 2004 and 2010, commuters between the New Orleans metro and its adjacent metros — Baton Rouge to the north and Houma–Thibodaux to the south — increased 11 percent despite the substantial loss of jobs and population in New Orleans post–Katrina. 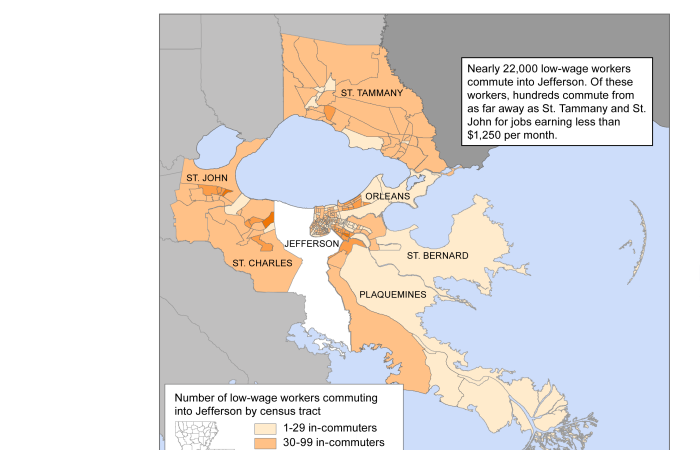 In 2010, over 26,000 workers commuted from the Baton Rouge metro to the New Orleans metro, while 22,000 workers commuted in the opposite direction. Another roughly 11,000 workers commuted from the Houma metro to the New Orleans metro in 2010, while about 8,000 commuted the opposite direction. The share of workers that commuted between Southeast Louisiana metros was similar to other multi–metro regions that collaborate on economic development strategies, such as Austin/San Antonio, Cleveland/Akron, Louisville/Lexington, and Tampa/Orlando. In these regions, business and economic development leaders are partnering to identify economic synergies and devise integrated and holistic business plans. In a globalized economy, the competitive advantage of Southeast Louisiana lies in achieving a critical mass of interconnected firms and institutions. Commuter data provides evidence of existing economic linkages between New Orleans, Baton Rouge, and Houma–Thibodaux. However, more research is needed to identify the industry specializations in each metro and determine how to combine local assets and industry strengths to become a stronger economic super region. Leaders in Baton Rouge and New Orleans have already taken the first steps by working together on common economic development issues.